For the past six months I’ve been designing a collection. I have developed the ideas for six garments and six accessories, made swatches, knit prototypes, re-knit prototypes, re-knit again; drawn charts, produced grading spreadsheets, written patterns, re-written patterns, written patterns once again; edited the patterns, styled the designs, and, finally, modelled them myself. I’ve by no means been alone in these endeavours: Mel works alongside me at every stage and her creative input and her superlative knitting skills are both completely invaluable parts of my process. I simply could not do what I do without her. Then there is Tom – who shoots the photographs, draws schematics and puts together individual pattern layouts – and the skills and expertise of my two tech editors play a completely essential role as we consider the group of patterns as a whole as well as individually. . . and all of this happens before we even start to think about releasing the patterns as part of a club, or putting them together into book form. 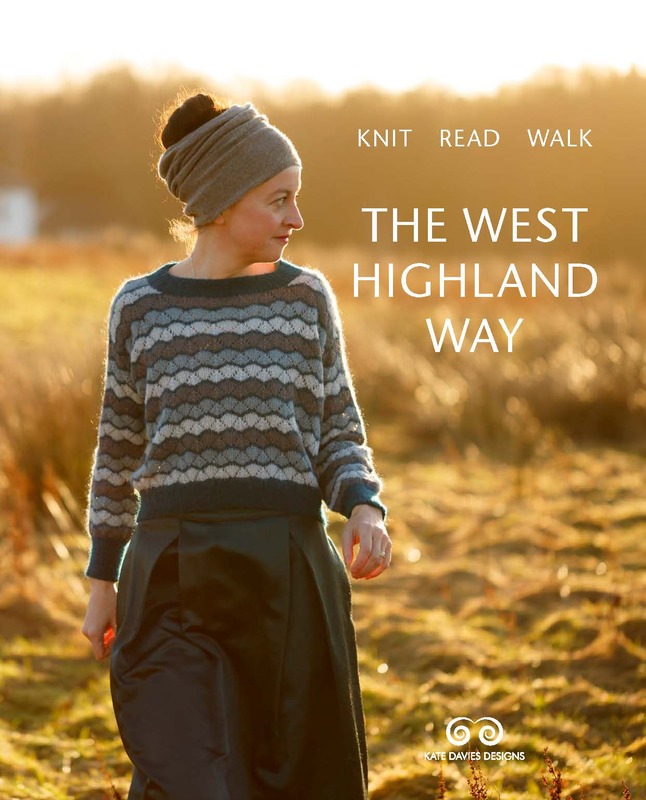 Creating the West Highland Way collection has been lots of fun (and I think this shows in the finished group of patterns), but it also is quite a lot of work. Often, when I’ve finished work on a collection, I get a yen to knit something completely different. Sometimes that something is a hat, sometimes it is a garment. This collection has involved quite a lot of fine-gauge knitting for me – including one really epic project that took several months of work. I was determined to get this project right, and I’m now very pleased with it, but, having completed it, I was definitely needing to work on something speedy and satisfying at a much larger gauge. I had an idea for a cropped jumper to go with my new skirt (each year I treat myself to a single piece from Cabbages and Roses). I knew that the Islay shade of Buachaille would look fantastic with the skirt, and thought I could knit a cropped jumper pretty quickly if I worked with two strands of yarn held double. So I designed the jumper in a sitting and knit it over four days – a very quick project for me! The results were pleasing: I liked what I’d knitted so much I decided to knit another, in a different colour . . . and now, it seems, I’m working on a third. Right now, for me, this jumper feels like the perfect winter garment . . . I’m not sure three will be enough? Anyway, I was wearing the original jumper yesterday when we went out for our local boxing day walk. I had not intended to take any pictures of the jumper or anything – but Tom had his camera with him (like he always does) – and the light and conditions were – not to put too fine a point on it – bloody extraordinary. So I took off my coat and we took some pictures of my boxing day outfit. Hold on Tom . . .here comes a swan! Like we needed something else to complete this crazy technicolour winter scene! Would you like to know more about the jumper? It is a super simple stockinette knit, worked from the bottom up at 3.5 stitches to the inch, cropped in the body, with a cosy roll neck. The key to the whole garment is the yoke shaping, which is calculated to allow all the stitches to be decreased away from the body over the full depth from underarm to shoulder. No stitches are decreased from the sleeves at all – they simply transform themselves into the neck at the appropriate point. Because of the way the shaping works, the garment hangs, slightly bell-like, from the shoulders, creating a neat early 1960s sort of silhouette. The other important factor to this garment fitting and sitting correctly is ease: I’m wearing the jumper here with five inches of ease at the bust, and I don’t think the straight lines of the garment would hang so well with too much less than that. This amount of ease means that it is straightforward to fit a few layers underneath . .
. . .and that the jumper is supremely comfortable to wear. So this is my boxing day jumper! I know that showing it here means that I now have to write a pattern. . . . can I have a couple of days off first, please? Would love to know where you got your skirt. I bought a golden yarn to make Carbeth that matches. So beautiful…everything! And the swan! What gorgeous everything … so inspiring. The last thing I need is another cropped jumper but this one … so lovely and I love the bell shape. Maybe I DO need another little sweater? Wow, love the short boxy sweater, and the colour is divine. I’ve started knitting again after nearly 40 (!!!) years and really enjoying it. Your post has really inspired me! All I can say is, “it is practically perfect in every way!” I must knit this ASAP. Fantastic and beautiful photography. Love cropped, boxy sweaters, and the colour suits you so well. I have been looking for a sweater like this! Fantastic photos and a gorgeous design. Thank you for your posts and work! Best wishes to all there for 2018! I will definitely be looking out for the pattern – if you do ever find yourself wondering what to work on next something with a similar structure for those of us who couldn’t carry off the cropped look would be fab! Like you my daughter can so I will be making one for her. I will buy the pattern and the yarn required as soon as you have it ready. Would love to knit and wear this. I’m looking forward to this pattern! And Holy Moly, what a beautiful day!!! -Jelly, jelly over here in Texas. This is such a beautiful jumper. I have been thinking of it since I first read the post and will wait excitedly for the pattern ! Super… yes you should have some days off! A pattern would be great, maybe also a longer version for those of us who don’t suit cropped sweaters? I just love the innovation of this pattern. My daughter has two very similar shape sweaters which she purchased from French Conection in their colle tion of this year one in navy and one in mustard – she wears them constantly as they are so versatile. Can’t wait for this pattern so that I can ask her one! Loving your creative work also the stunning photos. Gorgeous! A bloody extraordinary day indeed… glorious! Thank you for the lovely pictures – a beautiful walk into the new year. Meanwhile, what’s the gauge for the sweater? I’m already looking over my stash . . .
Wow! What a stellar backdrop for these photos and a glorious day to make the colours pop! Kudos to Tom for the stunning photography. And the JUMPER, what an amazing design. Perfect for a winter walk with layers underneath to shelter from the chill. Brilliant all around. New fan for sure! You have blend with the nature Kate. Tom deserves huge credit to painting pictures with camera. Everything about this post is unbearably lovely! wow. that is so lovely. really itching to make it now. pattern please when you’ve finished your holidays. So glad to’ve wandered into your winter wonderland. I love the jumper and miss the cold ever so much down south in florida. But we had a few days nip and even needed a jumper! Thank you and happy new year Kate! Nature here is not like nature, there. Knitting up some of your designs. Love the photos and the jumper. You look so beautiful in it!! I love saying jumper instead of sweater!! I do have a question – as my waistline is not quite as it once was do you think this could be knit longer and still look nice? I don’t think I could “pull off” a cropped jumper. ..one can almost breathe the crisp air…it looks like you’ve walked into a fairy story, with just the right outfit! What a stellar day that must have been. It looks like perfection! Looking forward to what 2018 surprises you have for us in wool and photographs. Best wishes for a wonderful 2018! Love the pattern but it us far too short. As a mature lady I would prefer it to at least cover my bittom6. That’s really lovely. Great shaping on the back. The jumper is to die for….as they use to say in the 60’s!!! Love the style so much!!! I would love to knit this!!! The perfect stylish comfy sweater!!! The Scenery is unbelievable and Tom’s photography is amazing as usual!!! This is beautiful Kate, and I’ve got some lovely turquoise alpaca in my stash (which has been in my stash for ten years!) that would be perfect for this. Do release a pattern soon! Beautiful jumper and photography. What great surroundings you live in as well. So looking forward to the new collection. And the photographs are stunning. Brilliant! I love the shape and wait with anticipation for the pattern. Happy New Year ! Stunning! You are an amazing model and Tom know how to create magic with his camera! Simply beautiful–I’ve never knit a sweater before, but this could be my first, I really love it! When the pattern is ready, you can count on this buyer! Most Happy New Year to you & yours. P.S.- Wonderful photos, as usual! Stunning, as always. You continue to be such an inspiration, both as a knitting designer, and as a strong woman. May 2018 bring you and Tom, and Bruce of course, only the very best in health and joy and love, and continued success ! Absolutely lovely ! The detailing, the yarn, the style …can’t wait for this pattern. Thank you for sharing such amazing photos. To you and yours … A happy new year ! fantastic jumper and I love your skirt! Your patterns, your knitting, your outfits, the landscape, and the photography are all so gorgeous. It’s akin to, and far better than, being in a sweet shop when I view your blog. Thank you for sharing! I LOVE this! The photos are stunning too! Of course, do take a well-deserved rest before sharing this oh-so-tempting pattern!! I knitted my second Fantoosh as a gift for Christmas and really loved again how smooth a knit it was, thanks for doing such a great work on your patterns! I just love this. Can’t wait for the pattern. Would like something similar in a cardi. I.e. Short and wide. Spectacular weather for a Boxing Day walk. Exceptional photography. Gorgeous sweater design and yarn color which I can’t wait to knit. And lovely model with her dog, in her favorite landscape:) Happy holidays, Kate and Tom and Bruce. I hope 2018 brings you much happiness. Thanks for a wonderful post to wake up to this morning. i love the structure of this boxing day jumper. For all of us fluffier knitters, would you consider writing a pattern for a longer sweater that can be worn over long skirts or pants? Ha! I would be your first customer! Trudy…I love your description “fluffier”. A longer length option would be marvellous, I agree! Meri Kirihimete – Merry Christmas to you and your whānau. The Boxing Day sweater is fabulous and the scenery – a day out of the box! Very best wishes for a happy New Year, and every day beyond. What a beautiful jumper and story! Looking forward to the pattern release. And the scenery is stunning!! Gorgeous! Will patiently await. Enjoy your holidays and your time off! Happy happy holidays to you and the gang! Love love love the jumper and will look forward patiently to its pattern. Enjoy your time off, especially in that gorgeous wonderland! What a beautiful sweater! And the weather-I so envy you. Here in Denmark on my small lovely island the rain never seems to stop. Looking forward to the pattern AND the new book/patterns! Wonderful shape and love the detail on the back. lpLooking forward to the pattern. Love it. I think I can knit this. No hurry tho. Xo’s. Happy New Year from NC. I love this design. It makes we wish that I lived in a cold winter climate! Another brilliant group of photos!!! I look forward to these moments of splendor… Absolutely breathtaking!!!! That is really beautiful, Kate! And the photography is just supreme! Lovely and ingenious sweater design! BEYOND phenomenal photography!!!! That top photo is stunning and the jumper popped immediately. I love a crop-the CYA (cover your arse) tunics take a lot more time and yarn. I look forward to the pattern Kate! Wonderful, perfect jumper! Waiting now for you to post information on getting the pattern! Everything about this post is dazzling and brilliant — the sweater, the light, Bruce, Tom’s photography, you, and the team we cannot actually see. This will be a fun knit, someday, when I can fit it in among the club items! And, bonus for when I get to the sweater — I shall be a bit slimmer because of all the walking for the WHW virtual walk! Happy New Year to all! Oh Kate, the photos are lovely and the sweater is a perfect piece to pop on and keep warm. Very cute sweater! Love it with the skirt and also love the color. Really like how you designed it. sale in Tom’s photography site. Please have a lovely break and then get right to the Boxing Day jumper pattern – it is too wonderful! Thank you for the lovely knits and photos and Happy New Year. It’s beautiful! And *cute. * I don’t get what you said about the shaping AT ALL. That’s why you’re the knitwear designer and I’m not. ;-) I have been inspired by you and cheering for you for 6 or 7 years now. I’m very happy to see that you are so happy. Take care of yourself and your health, and enjoy your holidays! P.S. You go out for a walk in a gorgeous new skirt and sweater??? IMPRESSIVE. Fantastic! 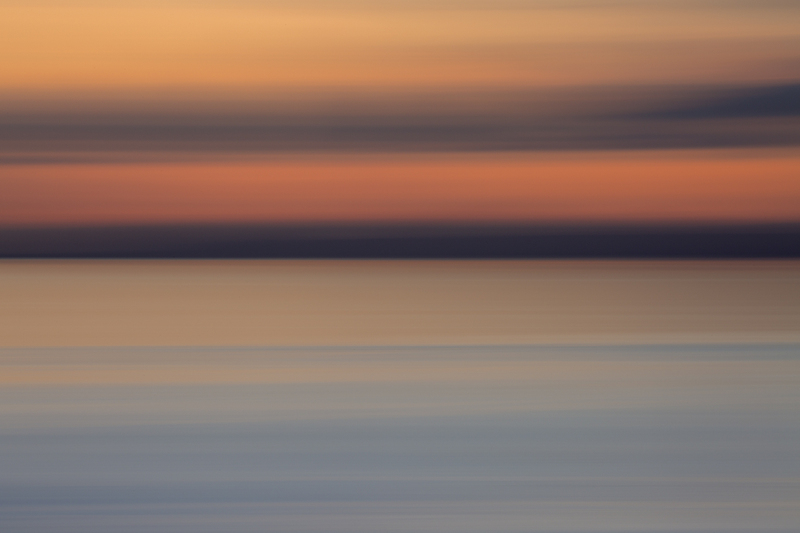 Photos are beautiful…..the colors, the happiness. Gorgeous pattern (I would just need to make it a little longer), gorgeous landscape! Please consider publishing the pattern when you have the time. All the very best to you, Tom, Bruce and Mel for 2018. Gorgeous pictures of a gorgeous sweater. I’m trying not to feel too peeved that you didn’t come up with the pattern beforehand as I have little time off, but had a crazy idea that I would knit a sweater while I am off between Christmas and 30th Dec when I go to the seaside. Alas, my Bingham is not going to make it that fast, but this wonderful creation probably would have done. However, such ungenerous thoughts are particularly inappropriate for the season so I’ll simply say how delighted I am to think of you wearing the perfect sweater to make your outfit and for the weather. Enjoy! My Boxing Day was made so happy by the arrival of the Milarrochy Tweed yarn. Can’t wait for the club to begin! It’s fantastic. I love the drape and the ease. I also love that the collar does not directly lie on the neck. As I age, my skin gets more sensitive so the collar is perfect. Especially when paired with a lovely scarf? I’m ready. It is now -10 in Wisconsin. Perfect weather to start a new sweater. Thanks for creating another wonderful design. Looking forward to the pattern when you have time to write it. Thanks for all the beautiful pictures and all the information you provided about the sweater and also your wonderful team. Enjoy the rest of the year and all the best to you, Tom, Mel, and Bruce in 2018. Stunning and the shaping is extraordinary. Very impressive work with the skirt is Perfect!! OK, that jumper is lovely, really! BUT that scenery!!! You couldn’t have ordered a more perfect day. The photography captures it beautifully! Looking forward to the pattern! I am hoping for a return to a more boxy fit for layering and you are ahead if the curve! Such beautiful colours and stunning backdrop. Hope it will be released as a pattern.Best wishes for 2018! Fabulous. I wish I was slim enough to wear it but I think I too might make it longer. A very guid New Year to you when it comes! I LOVE the construction – what a clever idea! As I have never been the right shape for boxy tops, I am wondering if this could also be knitted with a longer body, more like a tunic? All good wishes to you and yours for the New Year! I love it! And I was really happy to read that you saw your local as being extraordinarily beautiful, because as I started reading your post I said to Dan, “people in Scotland just have no idea how lucky they are to live in such beauty.” So, ok, I guess you do. But I am still quite jealous. Amazing Kate, I love the shape and that is my very favourite Buachaille colour!! Beautiful jumper, perfect with your new skirt – and oh, those photographs! A belated Happy Boxing Day to you, dear Kate. The photographs of you in that splendid landscape are truly beautiful. Such a great spirit is apparent. Tom’s photos are always so good, but there is something special in this collection. Ah that is lovely. Lots of things to love about it. Many thanks. Can’t wait for the pattern! Exactly the style I love! Beautiful! And, I will patiently wait for the pattern! Such amazing photos! A gorgeous post, a treat for the eyes, which holds the promise of a lovely new pattern for 2018. Please enjoy your two days off, then set to work on that pattern post haste! Thank you for all you and yours bring to us. It’s always a treat to see KDD pop up in my email inbox. The construction is intriguing. The garment looks fun too knit and to wear! Love this pattern and would love to stand in line here once again for it’s release, take a week or two off…. no need to be so miserly with yourself. Happy New Year Kate and company! Wow! 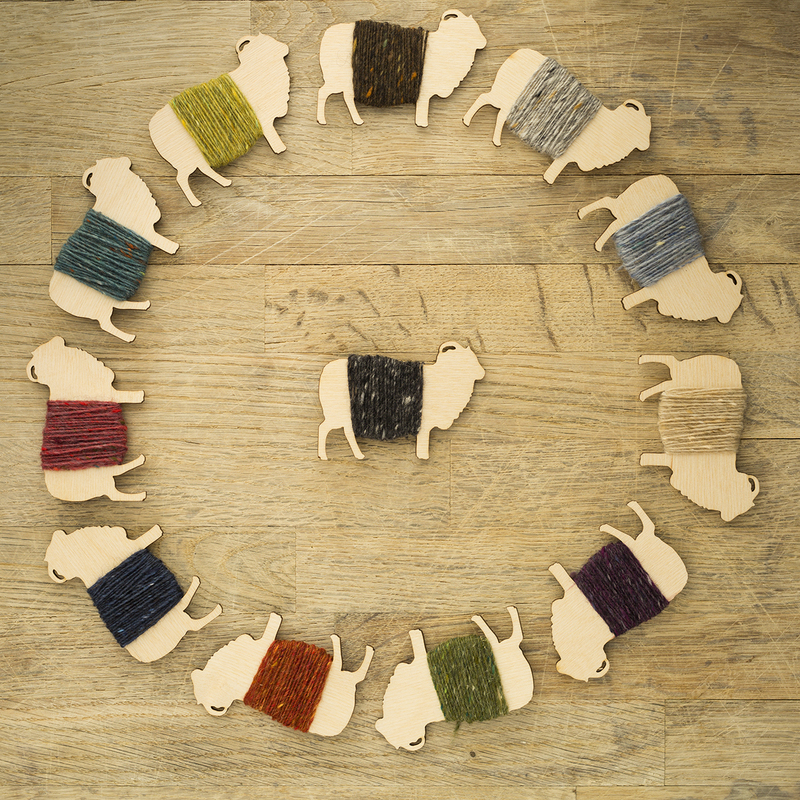 And I just bought the perfect yarn – really! just yesterday! So yes! A pattern please! Beautiful. Can’t wait for the pattern. Looks lovely with your skirt. Just beautiful!! Love the sweater and the pictures and the skirt!! very pretty….best wishes for you all! What a fun looking jumper! And the loch and photography are gorgeous! The light and hoarfrost are magical! Tom is an excellent photographer. It is very interesting to hear of all the pieces and contributors to designing your new collection (I’m a club member). All the best for 2018!!!! You are right, Kate, the light is extraordinary. My favorite time of the year for photographing the landscape. And the jumper is perfect. The back detail is beautiful. Will the knitting details be available soon? Ooh I love love love it so much, and then some because I’m a Boxing Day baby with issues about my birthday being perpetually overlooked. Anyhoo, when will it be published? I need to have one for all of my tweed skirts. Ohhh. Gorgeous. I would love someday to hear how you and Mel met and began working together. And of course the jumper pattern?